Plan your Georgia vacations easily and simply with Southern Belle Vacation Rentals. Time spent in gorgeous historic Savannah would not be complete without accommodations to match, and this is where Southern Belle can help. Savannah vacation rentals are plentiful in the area, but not all of them are filled with the nostalgic charm of days gone by and the modern conveniences you've come to expect. Check out our vacation homes Savannah and you won't want to look back. One of our coziest Savannah vacation rentals is Bird Baldwin Forsyth Suite. This unit is perfect for couples' Georgia vacations or a business trip for a single person. Bird Baldwin Forsyth Suite has one bedroom with a king-sized bed and one bathroom. Like all of our vacation homes Savannah, the location is extremely convenient with private parking on Liberty Street. It is close to all the shopping, the Savannah Coffee Roasters, Mellow Mushroom, and the rest of the historic district. Step inside the third floor unit of this historic Bird Baldwin House and find yourself charmed by the cozy shades of brown decor. Wood floors complete the look, along with old chest end tables. Settle in the living room while you read or watch shows on the flat-screen TV. The one bedroom also has a TV and fireplace, as well as an oversize chair for sitting. The bathroom features a pedestal sink and nostalgic bathtub with a ledge. The whole unit has plenty of windows to let in the Savannah sunshine. The kitchen gives you all the tools and counter space to prepare your own meals on your vacation. Enjoy warm Savannah evenings out on the deck with two chairs and a table. The unit also features Wi-Fi, central air and heat, plus all necessary appliances and towels. The best thing about Savannah vacation rentals at Southern Belle is how close they are to everything you want to see. Walking into Forsyth Park is a cinch from the Bird Baldwin house. Once there, you can view the iron fountain made famous by "Midnight in the Garden of Good and Evil," and then take a walk around the grounds or even have a picnic. Enjoy the trees draped in Spanish moss and the old southern architecture of historic Savannah. Many visitors say the town has somewhat of a mystique about it and if you're interested in ghosts and the supernatural, then there's even more for you to explore. Take a ghost tour or explore one of the many old cemeteries in the town. The Colonial Cemetery downtown is especially expansive with six acres of graves and memorials. Other popular destinations in downtown Savannah include the Mercer House and Monterey Square. The house was built in 1860 and played a big role in the ""Midnight in the Garden of Good and Evil" movie and book. The house is available for tours so you can explore its fascinating history. Make sure to leave some time to visit River Street. This expansive part of downtown is down by the river and hosts a variety of celebrations and festivals every year. It used to be a massive trading area for the town in the 1800s, but now the old warehouses serve as storefronts for boutiques, restaurants, pubs, galleries and much more. Savannah is always filled with things to do and festivals are a big part. Several different festivals take place during the year, so make sure to ask which ones might be going on during your stay. In the spring you might be able to catch the Savannah Music Festival or Liberty Mutual Legends of Golf, PGA Champions Tour. In the summer, you might see the Fourth of July Fireworks on the Beach or the Seafood & Music Festival. Prepare for Oktoberfest in the fall and plenty of Christmas celebrations in the winter. 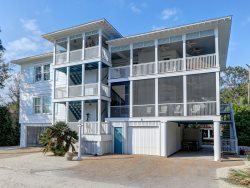 Renting vacation homes Savannah at Southern Belle is bound to be the simplest part about your Georgia vacations plans. We have such a wide selection of rentals that it's simple to find one that fits your plans and needs. Give us a call today to find out more about booking one of our properties. Blake was quick to arrive and help us solve the cable and wifi outage. The decorating and space was charming. Everyone on staff was friendly and helpful. What a gorgeous place to stay! We were right in the historic district and could walk to everything. It was spotless, roomy, and elegant. Loved the tub, the walk in closet, and location. I saved money by booking directly through the website rental property instead of an outside source and it was so much more in detail and helpful for our stay. We would absolutely recommend and use this rental company again for our travel needs. The Forsyth Park Suite was amazing. It matched exactly where we got engaged on the trip. So it will always mean something special to us!! It had the old southern charm features we were looking for for the perfect price. We were super pleased and highly recommend. Just a note that your office address is incorrect on the email communication you send out. Made a difference when we were trying to find you to drop our luggage ahead of check in and using uber. We were looking for albercorn. All communication was through email. It was efficient and thorough. We will be back! Thank you!! We really didn't have much contact with your team. Everything was done online and we didn't run into any problems or hassles. Everything went pretty smooth and easy. Thank you. This was our first vacation in 20 years. Your property was beautiful and we really enjoyed staying here. We loved Savannah and will be back. Of course, we will be checking out your rentals again. It felt like our house! We loved being close to what seemed like a million places to eat, drink and visit. They were all very good to work with, especially when contacting them about the possibility of cancelling due to hurricane Irma. The staff was fine and dandy. All good, and nothing bad. All in all, very excellent. The 1933 property is wonderful and delightful .